2. WebLogic / Oracle FMW to RAC Database connection: Using Active GridLink ? Watch Replay of FB Live covering Concepts difference between SSL/TLS, Off-loading, Keystores, JKS, Wallets and How to implement in these components. This post covers what is Oracle GoldenGate, how it works, who should learn it and 10 point checklist to learn Oracle GoldenGate like experts. 3. Who should learn GoldenGate? 4. 10 point checklist to learn GoldenGate? This post covers common questions related to Online Patching (ADOP) one of the most common task that Oracle Apps DBA’s (apart from Cloning & Troubleshooting). Register Now for approx 90 Minutes FREE Master Class on Oracle Apps DBA (R12.2) this Saturday 2nd Dec, 2017. This time I am doing something different, you will get a chance to directly interact with Me and get Live Q/A session on any topic related to Apps DBA (R12.2) in our private & dedicated Facebook group for Apps DBA on this thread at http://k21Academy.com/appsdbaqa (If you are not yet member of this group then join now). Join FREE but useful approx 90 Minutes Webinar on Oracle GoldenGate for DBAs, Apps DBAs, PL/SQL Developers Technologists responsible for Data Replication, High Availability Data Technologist, Cloud Migration Specialists or someone who is just starting in IT and wish to take their Career to next level for your Dream Job with Higher Salary. In this Webinar, I will be covering What, Why & What to learn in an Oracle GoldenGate! Register Now for approx 90 – 120 Minutes Oracle Golden Gate 12c for Replication Saturday, 9th Dec 2017. 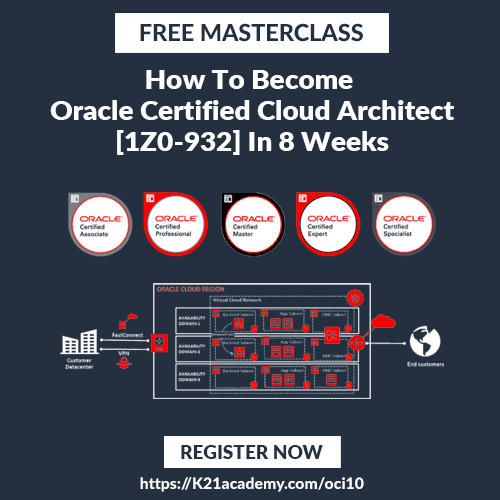 You will get a chance to directly interact and get Live Q/A session on any topic related to Oracle Golden Gate 12c, in our private & dedicated Facebook group for Oracle Learners on this thread at http://K21Academy.com/goldengateqa (If you are not yet member group http://K21Academy.com/joinfb then join the private Facebook group now). Its been a while that we caught up with each other. So Let’s Meet…!! What Say?? You might know that AIOUG(All India Oracle User Group) is organizing its Annual Conference Sangam’17, in Hyderabad this year and I am flying down as a speaker to present on Oracle Database On Cloud For DBAs: What, Why And How From Beginner To Expert and Oracle Identity & Access Management for Beginners : OAM, OIM, OUD, OID, OVD, OIF.